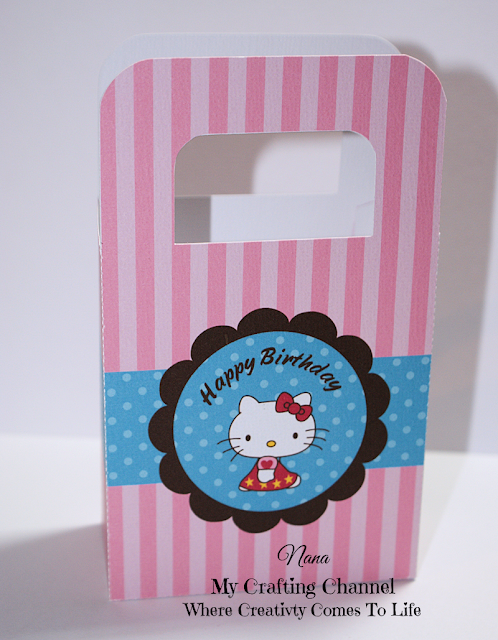 Sharing today a Hello Kitty Treat Bag. I found this pattern a while back and can not remember where. It was so simple to take the pattern into Silhouette and add the cut and score lines. Such an adorable treat box! I love the Hello Kitty belly band you added! The pink and blue papers work so beautifully together! I know my Granddaughter Arya would love it! Have a great day...hope you are doing well! Darling treat box, love the HK image. This hello Kitty treat box is so cute!Love the stripes and polka dots, oh and of course the kitty! What a super cute treat box!! Love the Hello Kitty image!!! Have a great day. Oh My Gosh... So darn CUTE! Adorable Project! Total sweetness! Hello Kitty is such a classic and she never goes out of style!